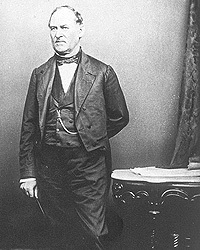 Though the Senate’s newest member, Browning became President Lincoln’s link to the chamber during the special war session that month. A week later, Nicolay wrote: “The President, Gov. Seward and Mr. Browning were together, and had considerable conversation about the case of Mr. Harvey.” James E. Harvey was a journalist who had been appointed U.S. Minister to Portugal Nicolay recorded that after a caucus of Republican Senators, “Mr. Browning came this evening more particularly to tell the President that he was satisfied that even if the Senate caucus should vote to take no action, that he had heard individual Senators declare their purpose to take the responsibility and themselves introduce such resolutions as would cause an overhauling and public investigation of the whole matter.”9 He also was privy to Mr. Lincoln’s thinking and sometimes was called on to do the President’s bidding – as in July 1861 when President Lincoln asked him to support journalist John W. Forney for secretary of the Senate. Browning’s friendship was unique in that his relations with Mr. Lincoln and Mrs. Lincoln were almost equally friendly. Many of Mr. Lincoln’s Springfield friends were no longer on good terms with his wife by the time the Lincolns moved to Washington. But the Brownings frequently visited Mrs. Lincoln – with and without his wife. Browning’s special standing with the family was particularly important when Willie Lincoln died on February 20, 1862. Browning came into Nicolay’s office that afternoon and was told of the death of the President’s favorite son: “He went and saw Mrs. L and promised at once to bring up Mrs. B,” Nicolay wrote. “Later I went to see the Prest. who had lain down to quiet T[ad] and asked him if I should charge Browning with the direction of the funeral. ‘Consult with Browning’ said he.”13 In this case and others, Browning’s relationship with the Lincolns was enhanced by his religious convictions. Browning’s family frequently worshiped at New York Avenue Presbyterian Church – and sometimes went home with the Lincolns to the White House after church services. It was natural and easy for Browning to arrange for the church’s pastor, Phineas D. Gurley, to preside at the White House funeral. Yours of the 17th is just received; and coming from you, I confess it astonishes me. That you should object to my adhering to a law, which you had assisted in making, and presenting to me, less than a month before, is odd enough. But this is a very small part. Genl. Fremont’s proclamation, as to confiscation of property, and the liberation of slaves, is purely political, and not within the range of military law, or necessity. If a commanding General finds a necessity to seize the farm of a private owner, for a pasture, an encampment, or a fortification, he has the right to do so, and to so hold it, as long as the necessity lasts; and this is within military law, because within military necessity. But to say the farm shall no longer belong to the owner, or his heirs forever; and this as well when the farm is not needed for military purposes as when it is, is purely political, without the savor of military law about it. And the same is true of slaves. If the General needs them, he can seize them, and use them; but when the need is past, it is not for him to fix their permanent future condition. That must be settled according to laws made by law-makers, and not by military proclamations. The proclamation in the point in question, is simply ‘dictatorship.’ It assumes that the general may do anything he pleases – confiscate the lands and free the slaves of loyal people, as well as of disloyal ones. And going the whole figure I have no doubt would be more popular with some thoughtless people, than that which has been done! But I cannot assume this reckless position; nor allow others to assume it on my responsibility. You speak of it as being the only means of saving the government of the U.S. – any government of Constitution and laws, – wherein a General, or a President, may make permanent rules of property by proclamation? I do not say Congress might not with propriety pass a law, on the point, just as General Fremont proclaimed. I do not say I might not, as a member of Congress, vote for it. What I object to, is, that I as President, shall expressly or impliedly seize and exercise the permanent legislative functions of the government. So much as to principle. Now as to policy. No doubt the thing was popular in some quarters, and would have been more so if it had been a general declaration of emancipation. The Kentucky Legislature would not budge till that proclamation was modified; and Gen. Anderson telegraphed me that on the news of Gen. Fremont having actually issued deeds of manumission, a whole company of our Volunteers threw down their arms and disbanded. I was so assured, as to think it probable, that the very arms we had furnished Kentucky would be turned against us. I think to lose Kentucky is nearly the same as to lose the whole game. Kentucky gone, we can not hold Missouri, nor, as I think, Maryland. These all against us, and the job on our hands is too large for us. We would as well consent to separation at once, including the surrender of this capitol. On the contrary, if you will give up your restlessness for new positions, and back me manfully on the grounds upon which you and other kind friends gave me the election, and have approved in my public documents, we shall go through triumphantly. You must not understand I took my course on the proclamation because of Kentucky. I took the same ground in a private letter to General Fremont before I heard from Kentucky. Browning’s wife had no such compunction about pressing the case. She desperately wanted him to be named to the Supreme Court and so wrote Mr. Lincoln in the spring of 1861. So did her husband. Instead he was named to the Senate – where friends of David Davis feared that he was using his proximity to and influence with the President to advance his prospects for the Court. The Missouri congressional delegation did register their support. In a desperate bid to prevent his appointment, Leonard Swett rushed to Washington in the summer of 1862 and nullified any patronage obligations that might be owed Swett if Davis would get the Supreme Court nod. Davis did and in the fall Browning lost his Senate seat. 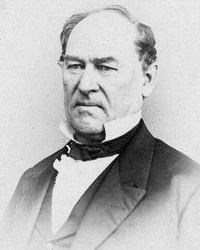 Browning’s political ambitions were cooled somewhat by his defeat for reelection, but revived again in late 1864 when the Chief Justiceship of the Supreme Court opened and it appeared likely that the position of Secretary of the Interior would be also be vacant. For the Supreme Court vacancy, Browning hardly seemed in the running. After Chief Justice Roger B. Taney died in October 1864, Browning, according to his diary, “Called on the President and urged on him the appointment of Mr Stanton as chief Justice. He said nothing in reply to what I urged except to admit Mr Stantons ability, and fine qualifications. I think he was pleased with what I said and I have some hope that he will adopt my suggestion.”22 Instead, Mr. Lincoln chose former Treasury Secretary Salmon P. Chase. For the Interior spot, Browning had serious competition from Illinois State Auditor Jesse K. Dubois and Iowa Senator James Harlan. Browning seemed curiously maladroit, however, in building political capital for such an appointment – and no Presbyterians came to his assistance as Methodists did successfully for Harlan. It was the second time Browning lost the position – it had been unreliably rumored to be slated to succeed Caleb B. Smith in December 1862. 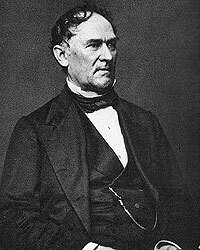 Browning finally got the appointment in 1866 – only after Mr. Lincoln died, and Harlan resigned from the post. “The President concluded to desert his tormentors today & travel around the defenses. Gillmore arrived & reported. Wright & staff also came in. At three o’clock P.M. the President came in bringing the news that the enemy’s advance was at Ft Stevens on the 7th Street road. He was in the Fort when it was first attacked, standing upon the parapet. A soldier roughly ordered him to get down or he would have his head knocked off. I can see a couple of columns of smoke just north of the White House. It is thought to be Silver Spring in flames – I was at Mr. Blair’s this evening: Fox says Gen. Wright tells him that Silver Spring is not burnt. During this period, Browning’s primary ambition seemed financial and he used his access to the White House to advance it. He turned down one administration job because the compensation was inadequate. When he needed help with his financial schemes, Browning knew where to go and where he had entree, however. His scruples did not prevent him from using his connections. He sought relief for his legal clients and help for business clients. Among Mr. Lincoln’s Illinois friends, Browning was not alone in trying to use his friendship for financial gain. But certainly he was the most persistent in personally asking his favors from the President. Mark E. Neely, Jr., The Abraham Lincoln Encyclopedia, p. 39. Carl Sandburg, Abraham Lincoln: The War Years, Volume III, p. 276. Theodore Calvin Pease and James G. Randall, editor, The Diary of Orville Hickman Browning, Volume I, 1850-1864, p. xvi. Allen Thorndike Rice, editor, Reminiscences of Abraham Lincoln, p. 603 (Thomas Hicks). Allen C. Guelzo, “Holland’s Informants: The Construction of Josiah Holland’s ‘Life of Abraham Lincoln’”, Journal of the Abraham Lincoln Association, Volume 23, Number 1, Winter 2002, p. 22 (Letter of Orville H. Browning to Josiah G. Holland, June 8, 1865). Carl Schurz, Reminiscences of Carl Schurz, Volume II, p. 89-98. Theodore Calvin Pease and James G. Randall, editors, The Diary of Orville Hickman Browning, Volume I, 1850-1864, p. 453 (February 7, 1861). Michael Burlingame, editor, With Lincoln in the White House: Letters, Memoranda, and Other Writings of John G. Nicolay, 1860-1865, p. 46-47 (Memorandum, July 3, 1861). Michael Burlingame, editor, With Lincoln in the White House: Letters, Memoranda, and Other Writings of John G. Nicolay, 1860-1865, p. 48 (Memorandum, July 13, 1861). Michael Burlingame, editor, An Oral History of Abraham Lincoln, John G. Nicolay’s Interviews and Essays, p. 3 (Conversation with Orville H. Browning, June 17, 1875). Michael Burlingame, editor, An Oral History of Abraham Lincoln, John G. Nicolay’s Interviews and Essays, p. 4 (Conversation with Orville H. Browning, June 17, 1875). Michael Burlingame, editor, With Lincoln in the White House: Letters, Memoranda, and Other Writings of John G. Nicolay, 1860-1865, p. 71 (Memorandum, February 20, 1862). Theodore Calvin Pease and James G. Randall, editor, The Diary of Orville Hickman Browning, Volume I, 1850-1864, p. 531 (February 25, 1862). Theodore Calvin Pease and James G. Randall, editor, The Diary of Orville Hickman Browning, Volume I, 1850-1864, p. 609 (January 2, 1863). Theodore Calvin Pease and James G. Randall, editor, The Diary of Orville Hickman Browning, Volume I, 1850-1864, p. 523 (January 12, 1862). Roy P. Basler, editor, The Collected Works of Abraham Lincoln, Volume IV, p. 531-533 (Letter to Orville H. Browning, September 22, 1861). Theodore Calvin Pease and James G. Randall, editor, The Diary of Orville Hickman Browning, Volume I, 1850-1864, p. 607 (December 31, 1862). Mark A. Plummer, Richard J. Oglesby, Lincoln’s Rail-Splitter, p. 43. Howard K. Beale, editor, The Diary of Edward Bates, p. May 31, 1860. David M. Silver, Lincoln’s Supreme Court, p. 70-71. Theodore Calvin Pease and James G. Randall, editor, The Diary of Orville Hickman Browning, Volume I, 1850-1864, p. 688. Theodore Calvin Pease and James G. Randall, editor, The Diary of Orville Hickman Browning, Volume I, 1850-1864, p. 677 (July 16, 1864). Carl Sandburg, Abraham Lincoln: The War Years, Volume IV, p. 52. Ward Hill Lamon, Recollections of Abraham Lincoln, p. 187. Carl Sandburg, Abraham Lincoln: The War Years, Volume IV, p. 132. Carl Sandburg, Abraham Lincoln: The War Years, Volume III, p. 277.